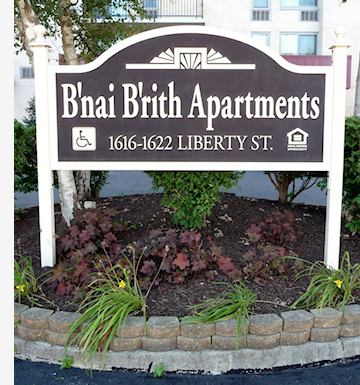 The B'nai B'rith Apartments are owned and operated by the Allentown B'nai B'rith Housing Corporation, a non-profit organization. The Corporation is comprised of members from the Charles Kline B'nai B'rith Lodge, in addition to members of the community at large. All members of the Board of Directors are volunteers and receive no compensation for their services. The Corporation was formed in 1974, and they opened their first building, B'nai B'rith House, an 11-story building with 150 apartments, on April 2, 1979. The second building, B'nai B'rith West, a 15-story building, opened on the adjacent site on January 11, 1983, with 120 apartments. The buildings are funded and subsidized through the U.S. Department of Housing and Urban Development (HUD). The original loan for the buildings was through the 202 Loan Program for the Elderly, and the tenants' rents are subsidized through the Section 8 Rental Assistance Program. Our B'nai B'rith Apartments are part of a network of other buildings serving the elderly and mobility-impaired populations. This network is coordinated by B'nai B'rith International Center for Senior Services. In addition to being available on a daily basis for questions, support and advocacy, B'nai B'rith Senior Housing and Services offers several training conferences for Management and Board members throughout the year. They also organize and sponsor a bi-annual leadership training conference for residents of the buildings.